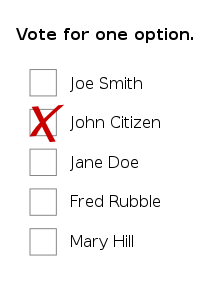 It has been suggested that this article be merged with First-past-the-post voting. (Discuss) Proposed since February 2018. Plurality voting is used for local and/or national elections in 43 of the 193 countries that are members of the United Nations. Plurality voting is particularly prevalent in the United Kingdom and former British colonies, including the United States, Canada and India. The countries that inherited the British majoritarian system tend toward two large parties: one left, the other right, such as the U.S. Democrats and Republicans. Canada is an exception, with three major political parties consisting of the New Democratic Party which is to the left, the Conservative Party which is to the right and the Liberal Party which is slightly off center to the left. A fourth party that no longer has major party status is the separatist Bloc Québécois party, which is territorial and concentrated in Quebec. New Zealand used the British system, and it too yielded two large parties. It also left many New Zealanders unhappy, because other viewpoints were ignored, so its parliament in 1993 adopted a new electoral law, modelled on Germany's system of proportional representation (PR) with a partial selection by constituencies. New Zealand soon developed a more complex party system. After the 2015 Elections in the United Kingdom, there were calls from UKIP to change to proportional representation after receiving 3,881,129 votes but only 1 MP. The Green Party was similarly under-represented. This contrasted greatly with the SNP in Scotland who only received 1,454,436 votes but won 56 seats, due to more concentrated support. The difficulty is sometimes summed up, in an extreme form, as "All votes for anyone other than the second place are votes for the winner", because by voting for other candidates, they have denied those votes to the second place candidate who could have won had they received them. It is often claimed by United States Democrats that Democrat Al Gore lost the 2000 Presidential Election to Republican George W. Bush because some voters on the left voted for Ralph Nader of the Green Party, who exit polls indicated would have preferred Gore at 45% to Bush at 27%, with the rest not voting in Nader's absence. Duverger's law is a theory that constituencies that use first-past-the-post systems will have a two-party system, given enough time. ^ "Plurality-Majority Systems". Mtholyoke.edu. Retrieved 2010-05-08. ^ "The Global Distribution of Electoral Systems". Aceproject.org. 2008-05-20. Retrieved 2010-05-08. ^ "Reckless Out Amid UKIP Frustration At System". Retrieved 2015-05-08. ^ Rosenbaum, David E. (2004-02-24). "THE 2004 CAMPAIGN: THE INDEPENDENT; Relax, Nader Advises Alarmed Democrats, but the 2000 Math Counsels Otherwise". New York Times. Retrieved 2010-05-08. ^ Bernard Grofman; André Blais; Shaun Bowler (5 March 2009). 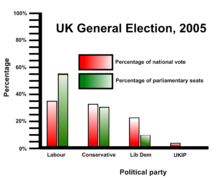 Duverger's Law of Plurality Voting: The Logic of Party Competition in Canada, India, the United Kingdom and the United States. Springer Science & Business Media. ISBN 978-0-387-09720-6. ^ "Electoral Systems". ACE Electoral Knowledge Network. Retrieved 2015-11-03.